CA Mobile Device Management (CA MDM) is a scalable, on-premises and SaaS mobile device management solution designed to help you control and secure mobile and desktop devices as well as deploy applications. Employees who prefer to carry a single device for work and personal use require secure mobile device management. 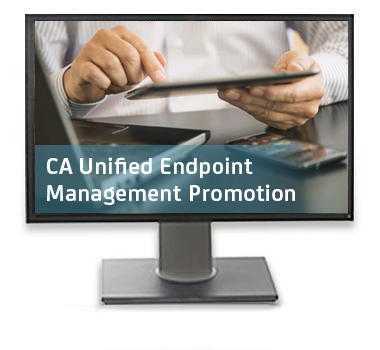 CA MDM provides this security, enabling enterprise productivity apps to securely reside on users’ personal devices. Consequently, sensitive corporate data resides on devices that are protected from theft and loss as well as virus and malware threats. Designed to be a sustainable approach to unlocking the value of mobility, this mobile device solution can give your IT complete deployment flexibility and provide users with productivity-enhancing bring your own device (BYOD) freedom. CA MDM is equipped with robust, enterprise-level application management and data security features to help you maintain a seamless mobile experience for end users—without sacrificing safety. Improve enterprise productivity by deploying BYOD support as an on-premises or SaaS solution. Strengthen security with locate, lock and full wipe options. Increase IT efficiency by reducing need for intervention. Control costs with real-time analytics.